Endometriosis is a condition where tissue, similar to the tissue that normally grows inside the uterus, also grows outside of the uterus. 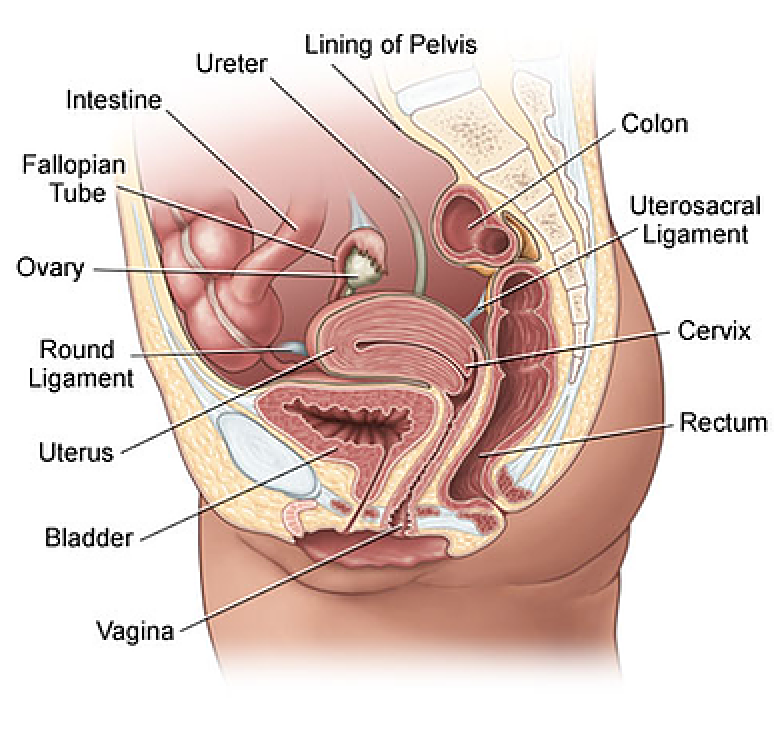 The tissue inside the uterus is called “endometrium” and the tissue outside of the uterus is called “endometriosis”. The most common places where endometriosis occurs are the ovaries, the fallopian tubes, the bowel, and the areas in front, in back, and to the sides of the uterus. Some women with endometriosis have few or no symptoms while others have pain or difficulty becoming pregnant. There is no cure for endometriosis, but there are several treatment options. The best treatment depends on your individual situation. The cause(s) of endometriosis is not known. A common theory is that some menstrual blood and endometrium flows backwards from the uterus through the fallopian tubes and into the pelvis during a menstrual period. This tissue then grows where it lands in the pelvis. This is called the retrograde menstruation theory but is now widely discredited or seen as only a partial explanation. There are several other theories and there is ongoing research to find a cause for this condition. Some women with endometriosis have no symptoms. The most common symptom is pain in the pelvic area, especially with periods. Some women with endometriosis may find it difficult to conceive. Just before or during the menstrual period. In some women, painful periods get worse over time. Between menstrual periods, with worsened pain during the period. With bowel movements or while urinating, especially during the period. Pelvic pain can be caused by many other conditions including pelvic floor muscle spasm, pelvic girdle (bone-related/ligamental) pain, pelvic infections, bladder pain syndromes and bowel causes e.g. irritable bowel syndrome. Difficulty getting pregnant — Endometriosis can make it more difficult to become pregnant. This might occur because endometriosis may cause scar tissue to develop, which can damage the ovaries or fallopian tubes. Even women with endometriosis who do not have scar tissue can have difficulty becoming pregnant. In women who become pregnant, endometriosis does not harm the pregnancy. Symptoms of endometriosis often improve during and after pregnancy. Endometriosis may be suspected based on your symptoms of pelvic pain or painful menstrual periods. Endometriomas (chocolate cysts) — Women with endometriosis can develop ovarian cysts containing endometriosis; this is called an endometrioma. Endometriomas are usually filled with old blood that resembles chocolate syrup; thus, they are sometimes called chocolate cysts. Endometriomas are sometimes seen during a pelvic ultrasound or felt during a pelvic exam. However, the only way to know for sure if you have endometriosis is to have surgery so a doctor can actually see and biopsy the abnormal tissue. Endometriosis is considered mild, moderate, or severe depending on what is found during surgery. Women with mild disease can have severe symptoms, and women with severe disease can have mild symptoms. Non-Hormonal painkillers e.g. paracetamol, codeine and nonsteroidal anti-inflammatory drugs such as Ibuprofen. These medications often work better in combination e.g. Paracetamol and Ibuprofen. Note: These painkillers do not shrink or prevent the growth of endometriosis. Hormonal medications e.g. oral contraceptive pill and progestogens (tablets, injections, implants, Mirena IUS). Note: You may be advised to take the oral contraceptive pill continuously (i.e. no pill-free interval) for three or more months. This allows you to have fewer periods and have less pain and bleeding during each period. Gonadotropin releasing hormone agonists — These medicines (injections) work by causing a temporary menopause. The treatment causes the ovaries to stop producing oestrogen, which causes the endometriosis implants to shrink. SURGERY:- The goal of surgery is to remove or destroy (ablate) endometriosis implants and scar tissue. Laparoscopy (‘key-hole’ surgery) is the gold-standard for diagnosis as well as the excision or ablation of endometriosis – see TREATMENTS section for further information on laparoscopy. You have tried other treatments but continue to have severe symptoms. You do not want to become pregnant in the future. You want a permanent treatment.